Camellias bloom in fall through spring, when few other plants do. Camellias are also one of the few exceptions to the usual rule of not planting when a plant is in bloom. Many varieties are at their peak now, so it’s a good time to buy and plant. 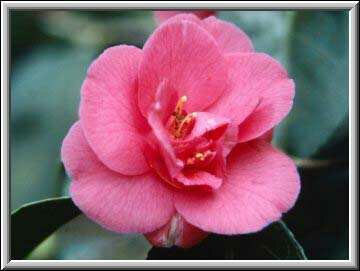 Camellia japonica is the most popular of all the camellias because of its wide variety of colors. With either double or single form 4″ symmetrical flowers and with glossy bright leaves, Camellia japonicas provide color and beauty. Camellia sasanquas are also very popular. They also have been bred into a variety of flower colors, sizes and shapes. The japonicas tend to bloom later than the sasanquas but both may be found blooming in January. This is an ideal shrub to grow in shaded plant groupings, even as close as three feet from house foundations, sidewalks or patios because the roots are not invasive. Since they tend to spread out as they grow, plant them about 5 feet apart. Camellias also do well as container plants for those who don’t have much ground space. They make great ‘patio plants’ for this reason. Make sure the soil pH is 6.0-6.5 and drains well. Camellias do not like ‘wet feet’! Avoid overwatering, and watch out for camellia blight, a fungus that causes buds and flowers to brown and decay. To control this malady, clear away and dispose of any spent flowers and fallen leaves.